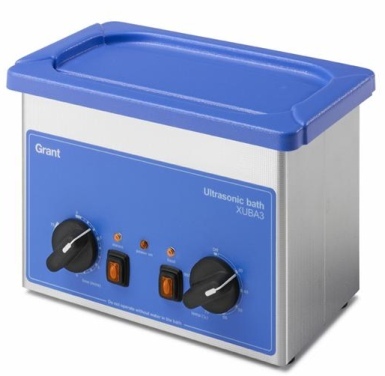 Compact analogue controlled range of ultrasonic baths, providing a high standard of reliable and effective ultrasonic technology. Suitable for use in a wide range of applications from healthcare to laboratories, the choice of two baths come in a great value-for-money package, with stainless steel basket and ABS plastic lid included as standard. The XUBA and XUB series of reliable, high-performance ultrasonic baths offer fast, safe and cost-effective consistent ultrasonics for various scientific and laboratory applications. Unique transducer technology provides outstanding performance and reliability. Gentle yet effective cleaning ensuring consistent results for rapid and complete removal of contaminants. Ultrasonic baths suitable for sophisticated applications in the scientific sector such as degassing, sonochemistry and fluid dissolution. Clean finish, high-quality and robust design for long-term reliability and durability. A choice of five digital and two analogue models. The XUB and XUBA range of baths are ideal for cleaning of a wide range of laboratory instruments as well as in other healthcare, medical and industrial applications. The ultrasonic activity generated in the baths allows rapid and effective cleaning and processing of a wide range of instruments and components - a safer alternative to manual operations.